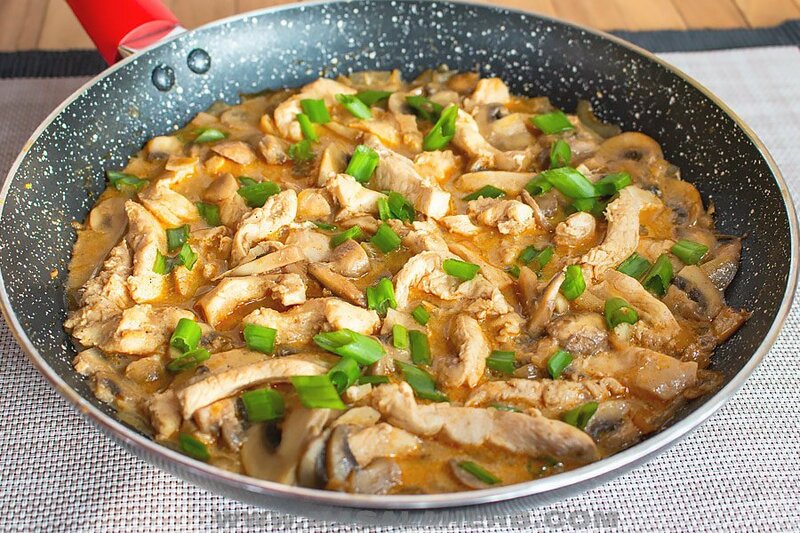 Chicken Geschnetzeltes with Hunter Sauce is a delicious one-pan meal that you can prepare within 25 minutes! This dish is super popular in Austria and resembles the Jagerschnitzel and the Chicken with mushroom white wine. Geschnetzeltes is a Swiss/Austrian definition for sliced meats. When someone says geschnetzeltes it can either mean chicken strips cooked in a sauce or stir-fried as in a Paprika geschnetzeltes. Where does Geschnetzeltes come from? Geschnetzltes is a typical family dinner meal in Austria, German-speaking Switzerland, Bavaria in South Germany, South Tyrol in North Italy and Hungary. Commonly Geschnetzeltes is prepared with turkey breast meat pieces or chicken. Turkey is more commonly used in West Austria, for example. In Switzerland, around the capital Zürich, they use fine veal meat and they call this dish züricher geschnetzeltes. Pork is not commonly used for geschnetzeltes and beef is less common as well. What is the Hunter Sauce? Hunter Sauce is also known as Jägersauce (Jagersauce or Jaeger sauce in English) and Chasseur Sause in French. This ultimate sauce is mainly made of mushrooms with cream and is always served with either meat steaks, flat unbreaded Schnitzel, pork chops or Geschnetzeltes. The hunter sauce by itself is also a popular spaetzle sauce. The Hunter Sauce got famous all over the world because of the iconic Jägerschnitzel, which is a classic dish in the German-speaking regions. In the former German DDR, they had a dish called the same way but they would prepare it with sausage like mortadella. So, not to be confused! German-speaking immigrants popularized the hunter sauce in the US. Because of its popularity, the hunter sauce ended up being prepared in different ways. 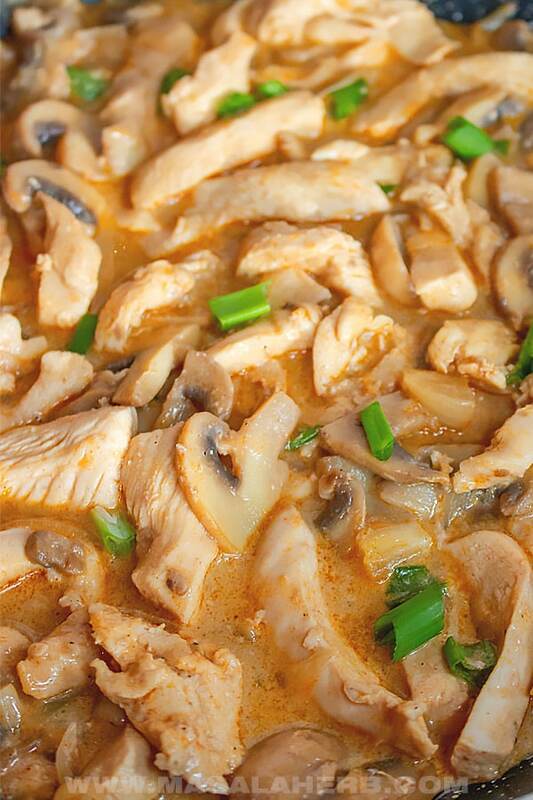 What usually stays the same is the addition of onion, cream, and mushrooms. Other ingredients can be white wine and tomato sauce as well as fresh herbs. My recipe doesn’t include tomato sauce because I used to make this for the whole family after I learned to cook it in college and my dad couldn’t digest tomato sauce. I create in time the perfect Jagersauce without tomato paste. In Austria and Germany, tomato sauce is a main ingredient to the Jägersauce. 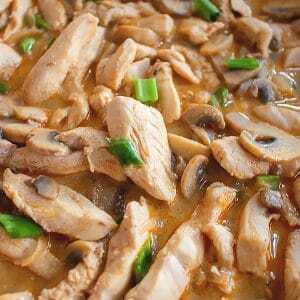 How to serve Chicken Geschnetzeltes? 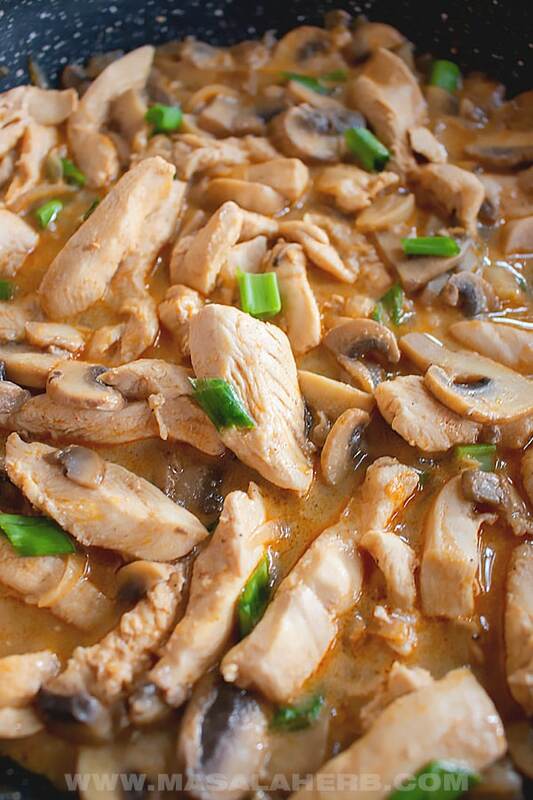 Tender Chicken Geschnetzeltes cooked in a delightful mushroom cream hunter sauce. The perfect weeknight one-pan meal for two. Serve up with plain pasta noodles, Spätzle, dumplings or rice. Heat up a pan with the butter and add your sliced onion. Cook the onion soft and translucent. Add your sliced mushrooms to the pan. Cook the mushroom until they have reduced in size as seen in the video. Next, keep on medium to high heat and pour the wine over the mushroom. This is called to deglaze. The wine will evaporate so stir cook quickly. Season with salt, black pepper, paprika and add a piece of bay leaf. Now pour the broth and the cream into the pan over the mushrooms and mix it all well. At this stage add your chicken strips. We add them now because they kind of get poached in the sauce and they won't overcook and get chewy but remain tender. 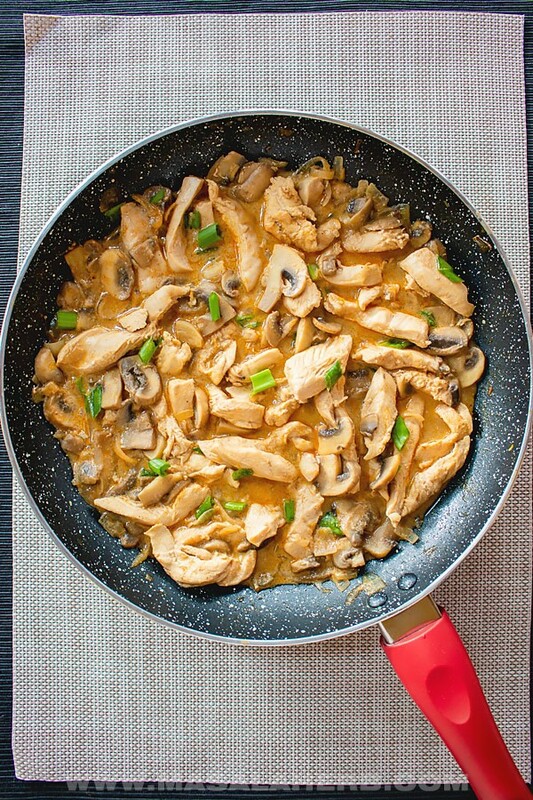 Mix your chicken geschnetzeltes into the mushroom sauce and turn them at some point so that they get cooked on all sides. Cook until chicken is done but doesn't overcook! garnish with freshly chopped chive pieces. Use Heavy whipping cream or fresh cream, because these contain more fats and don't separate when heated up. Fresh cream is a common french and European thing. If you can find fresh cream use that, otherwise liquid whipping cream. Eventually, if you don't have a choice simply use regular liquid cream but don't overheat it! Try to get A grade chicken breast. That's better quality and the chicken pieces won't turn that quickly chewy if you don't overcook them. Dear Reader, have you ever had geschnetzeltes and hunter sauce before? 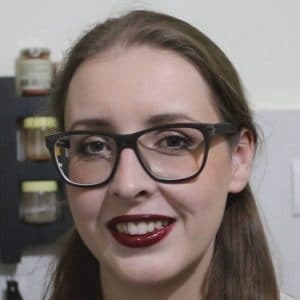 Hi, this may be interesting you: Chicken Geschnetzeltes with Hunter Sauce!